What Is Your Core Identity Assumptions Quotient? "The Right Fit Method Strikes A Nerve: What Is Your Core Identity Assumptions Quotient (CIAQ)?" (This show is the first in a two-part series on Core Identity). 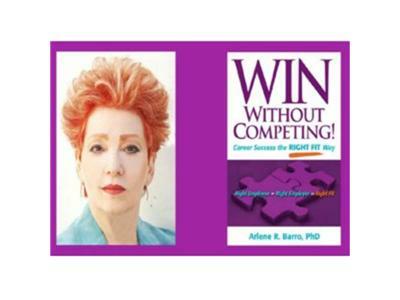 On WIN Without Competing!, Dr. Arlene will strike the Core Identity Nerve in her guest interviews. Picture an apple with a core. With the precision of a surgeon, Dr. Arlene will cut the apple in half, in order to examine its core. In her conversations with her call-in guests, she will probe to reach the essence of their unusual Core Identity transformations. For many, changing Core Identities is a daunting task coupled with fear. For others, it is a joy. What about you? Have you found the Right Fit Core Identity? During the show, be sure to take Dr. Arlene’s Core Identity Assumptions Quotient Quiz to find out what erroneous assumptions you are making which can prevent you from changing Core Identities. To learn more about finding your Core Identity right now, read Chapter Four- -“Your Core Identity: Know Thyself Now” in Dr. Arlene’s book WIN Without Competing!